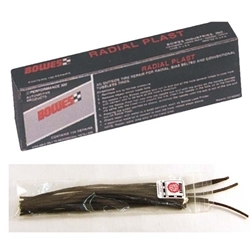 Radial Plast Inserts BOWES TR 37526 Box of 100. The same design of repair as Multi Plast, Radial Plast is an ideal repair for passenger and small tires. Conveniently cut into 7” lengths. Radial Plast is a quick and economical repair and because there is no need for reaming, you have no worries about damaging a customer’s tire by cutting cords.